So before you get ahead of yourself with all of your healthy eating plans and goals, take this first step. Throw on some tunes and carve out one hour, really, that's all you need. You'll be so happy you did it. Like anything else it really helps to have a game plan. Here are some tips to get it done. There's nothing that kills your motivation to cook up a healthy meal like a disorganized pantry. Struggling to find ingredients, digging up near empty packages, boxes toppling down from shelves and open packages spilling on the floor make you wanna just reach for the phone and dial up some take out. I struggled through the frustration of a disorganized pantry for years before really appreciating the beauty of an organized kitchen. You'd think for someone who loves cooking and playing around with new recipes, I would have had this dialed a long time ago. It was one of those things that was forever on my to do list but somehow kept creeping to the bottom, below seemingly more necessary household tasks or actually going out and doing something fun like going to the beach or meeting a friend for a glass of wine. Now I'm not trying to convince you that this is the most fun thing you'll ever do, but let me tell you, for the small investment of time it actually takes, it is so worth it. You will save a whole lot of stress and frustration every time you cook and you'll save money not buying duplicates of everything that's already buried away in there. So before you get ahead of yourself with all of your healthy eating plans and goals, take this first step. Throw on some tunes and carve out one hour, really, that's all you need. You'll be so happy you did it. Like anything else it really helps to have a game plan. Here are some tips to get it done. Use this as an opportunity to set up an environment that will support your health goals. Take everything out of your pantry so you can see what you have and get rid of the junk, anything past its due date or half opened packages of stale who knows what. Get rid of bulky packaging and in the future, see what you can get in bulk. This allows you to get the exact portions you want. Especially great for spices. Now what to do with these loose items? Get some clear jars or containers so you can see what's inside. I use a variety of these ones from IKEA for grains, pasta, nuts, seeds, dried fruit, spices and flours. They'll keep your food fresh for a long time, especially when stored in a cool, dry place. Having a few baskets is great as well. It will keep any miscellaneous items organized and easy to find. I know I just mentioned them briefly, but they deserve their own bullet as they really are key to a delicious, healthy kitchen. Putting together my own spice rack, or shelf in my case, has been one of my best and favorite investments (for very little cost). Having a variety of spices on hand arms your for almost any recipe without wasting time running out to the store every time you need something new. I use these ones from IKEA but I've seen variations in most dollar stores. Wondering how long your spices will last? Check out this handy chart. We installed some extra shelves on a wall that was otherwise just a waste of space and got a rolling metal drawer unit. Something like this or this. There are tons of different ways of doing this. Get creative and maximize your space. 7. Organize by frequency of use. 8. Organize by food type (with the above tip in mind). I keep baking stuff on the top shelf, then cereals and grains, nuts/seeds/snack foods next, followed by spices and flavoring with the heaviest stuff on the bottom -- canned and jarred goods -- along with any other miscellaneous items. 9. Keep a running list. 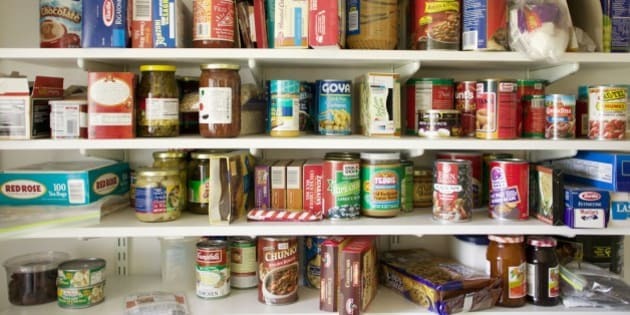 Post a notepad on the inside of your pantry to help you keep stock of what's in there (I do the same with the freezer). Whenever I run out of something, I add it to the list. This will save time with meal planning, knowing exactly what you've got, and make writing a grocery list out a cinch. Time to put it into action! And if you know someone who could use a little kitchen organizing share this article with them. For more ideas on how to become a pro in the kitchen, visit www.lindsayjang.com. What are your best kitchen organization tips? I'd love to hear from you in the comments below.